The above prices on this item reflect a 3% cash/check discount. This discount is not valid for credit card purchases. Add 3% to the total cost for credit card purchases. 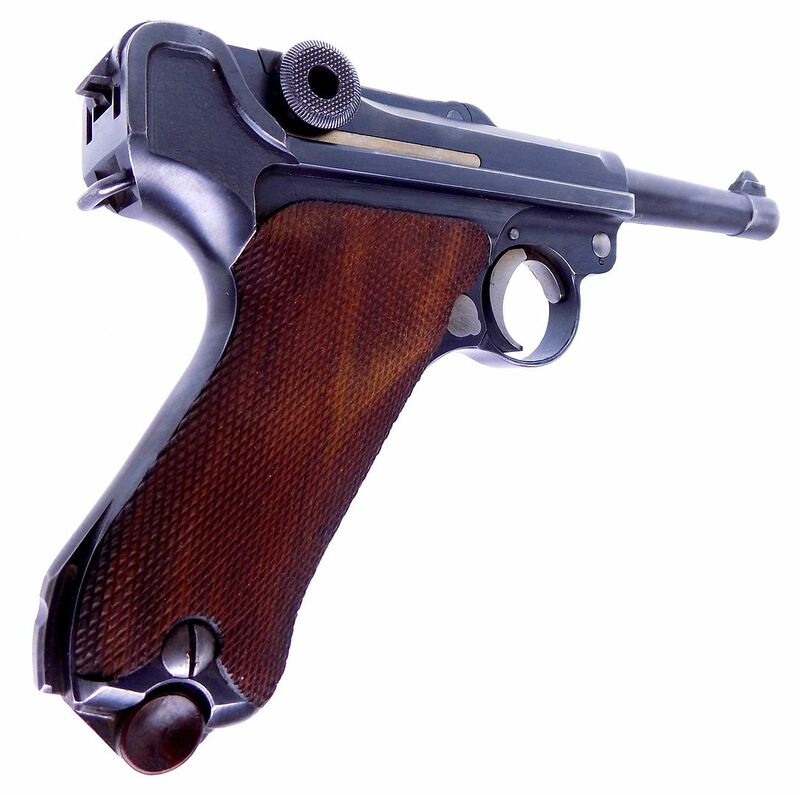 Fine Estate & Consignment Firearms! 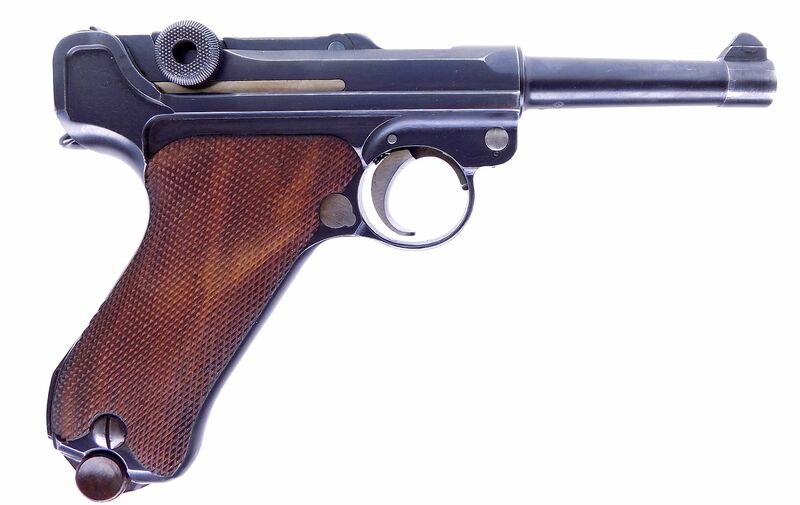 This auction is for a "Gorgeous" example of a Post WWI DWM model 1920 Commercial contract Luger chambered in 7.65 mm Luger Auto. 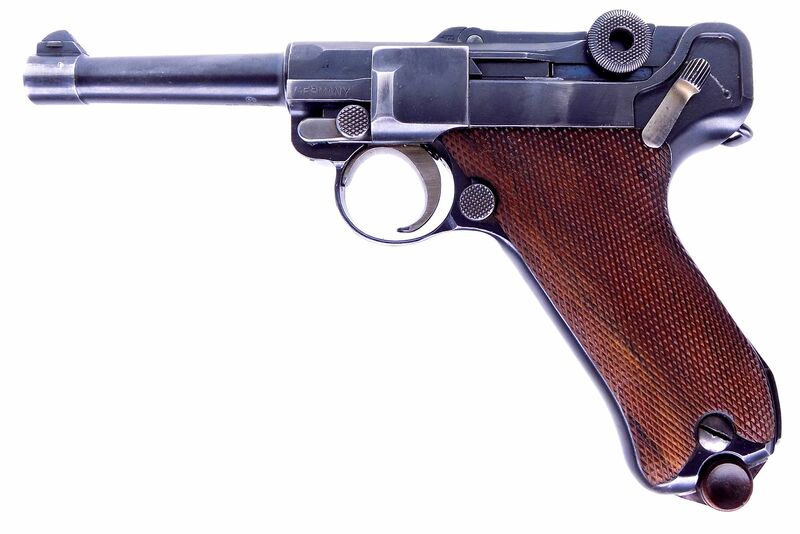 This post-war pistol was exceptionally well made since the DWM factory was trying to find new commercial sales overseas. 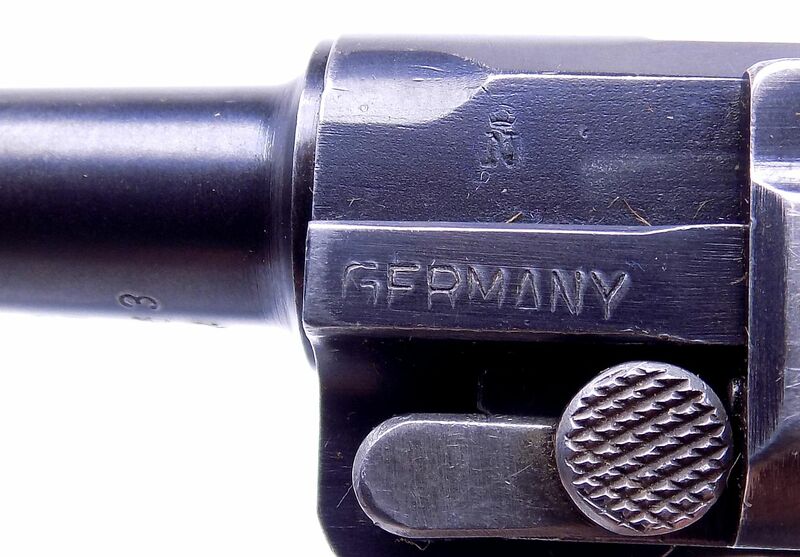 With this one having the "Germany" marking it was manufactured to sell overseas. 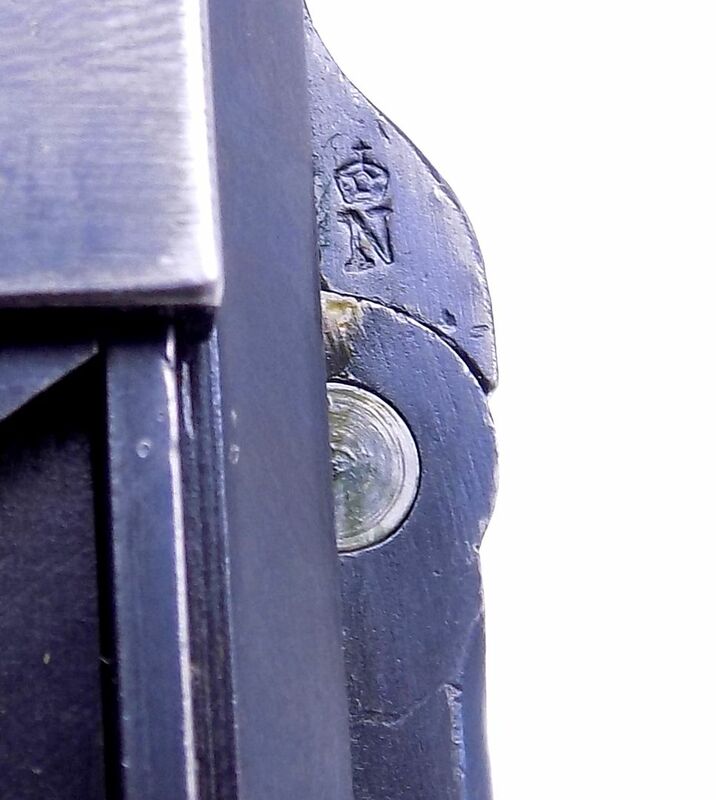 This model has the blank chamber with the "DWM" logo top of the front toggle. 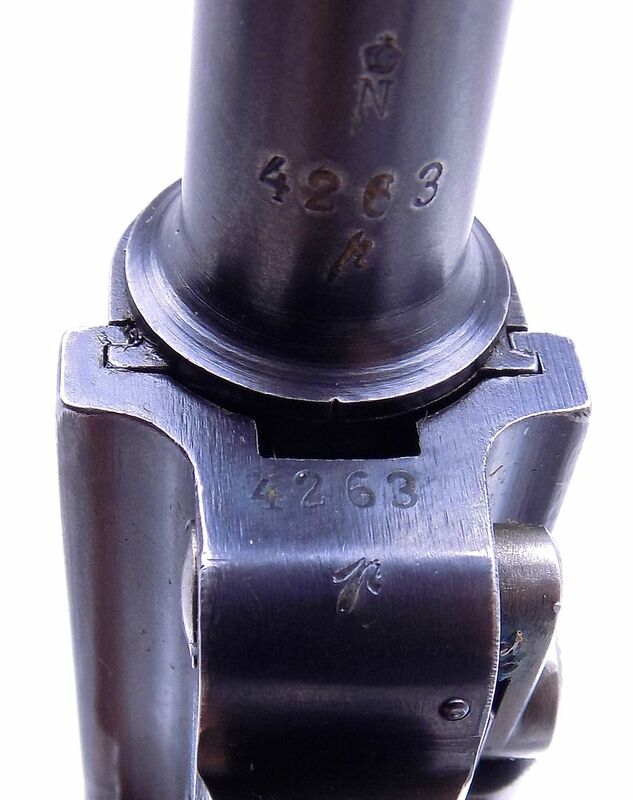 The underside of the barrel along with the left side of the barrel extension and front toggle are all stamped with a single "Eagle/N" commercial proof. 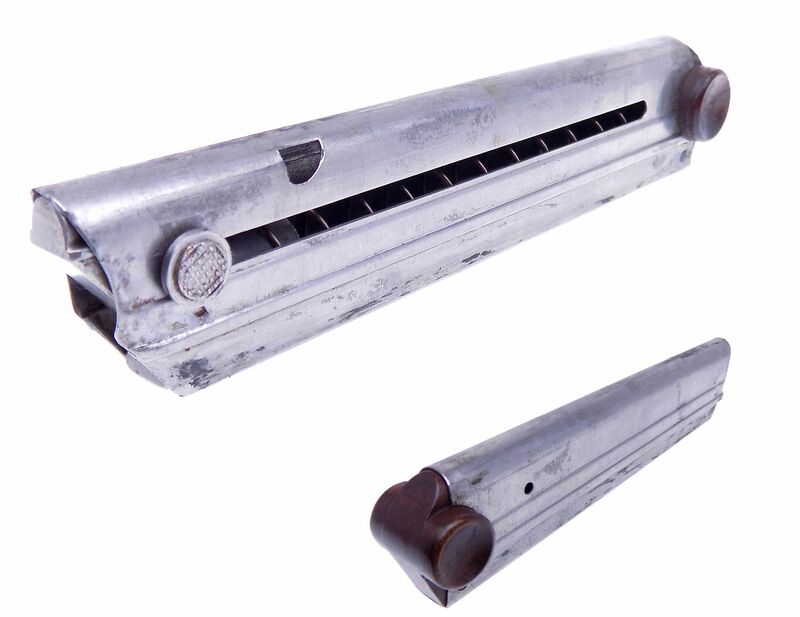 It has a beautiful rust blued metal finish with straw colored smaller parts. 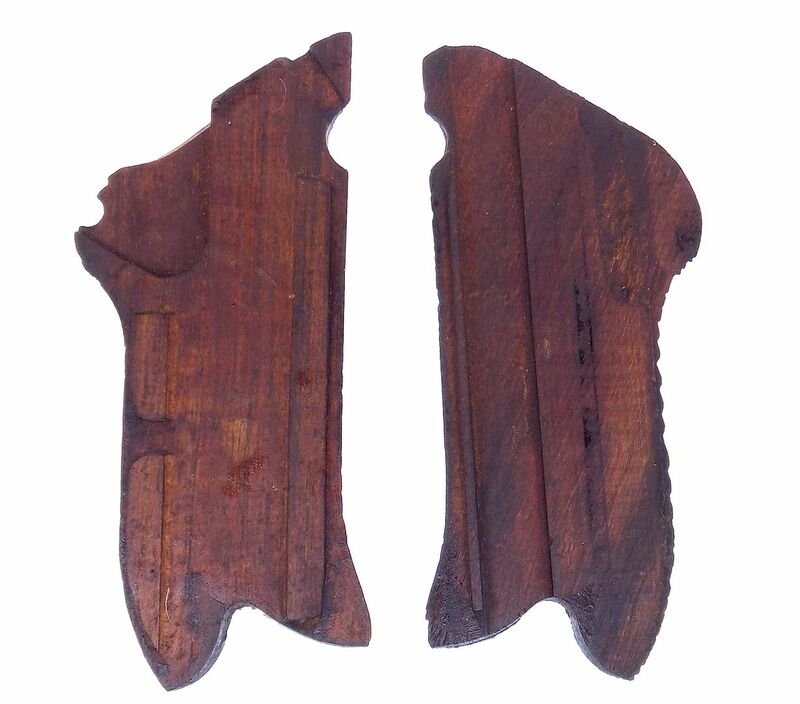 The finish shows some wear indicative of holster use in the past but overall the bluing is in excellent condition. The straw colors are bright as you can see in the pictures. 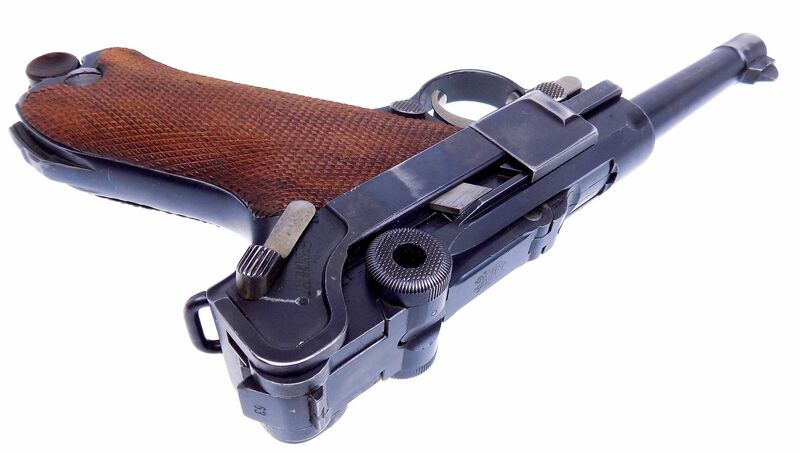 It comes with one original magazine that has a polished steel magazine body with a unmarked wood base. The bore is very fine with light frosting in the grooves but bright. 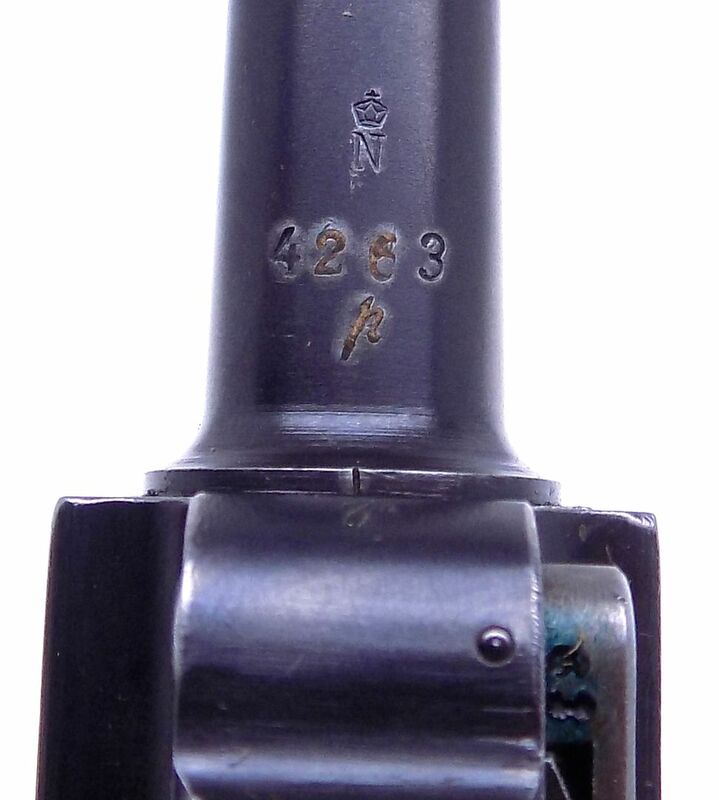 The serial number is 4263p which is matching on the barrel and frame with the smaller parts being marked (63). 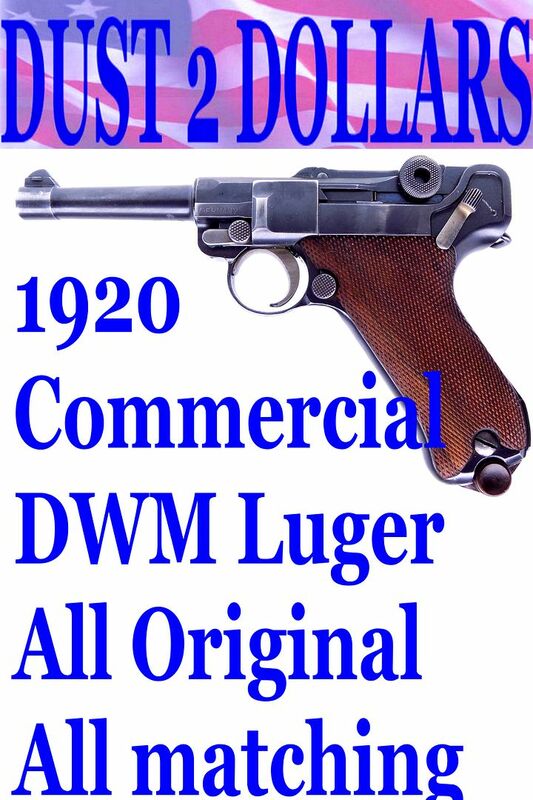 Overall this is an excellent example of this version of a 1920 Commercial DWM Luger. 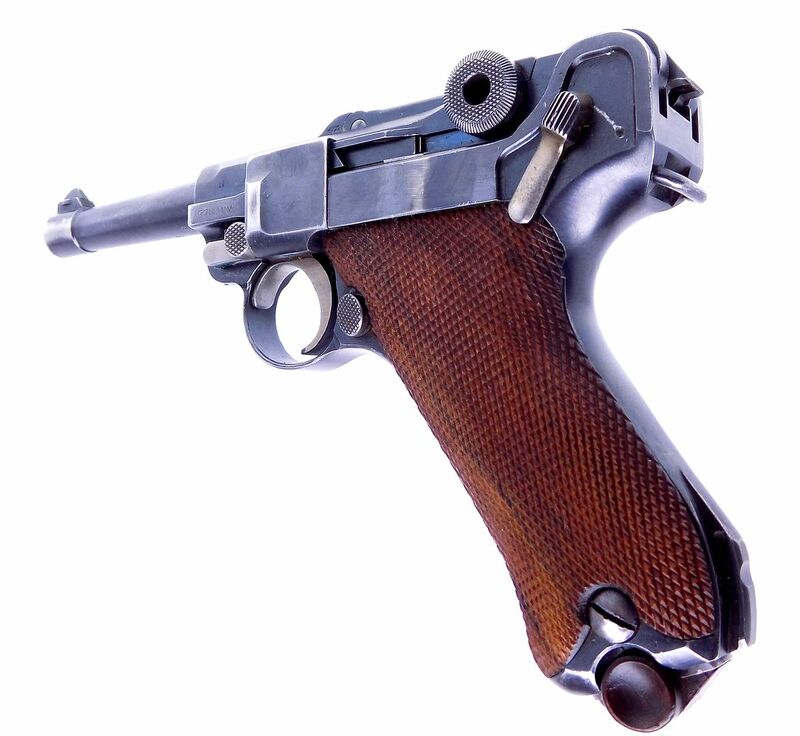 We have shown the complete pistol in the full sized high resolution pictures below for your consideration. This will be shipped USPS Priority Mail fully insured with signature tracking to your FFL dealer or C&R for $28.00. Bid with CONFIDENCE ~ Dust 2 Dollars has conducted over 32,800 auctions in our 18 years in business! As well as being an "FFL" Federal Firearms Licensed Dealer with over 22,800 positive feedbacks from Internet sales. Payment ~ At the end of an auction Gun Broker sends out an email stating that you are the winning bidder. Contained in that email is a "PAY NOW" link you can use to pay for the auction immediately. Or, payment can be with a USPS Postal Money Order, check or Certified Bank Check. We also accept Visa, Master Card and Discover with a 3% convenience fee added to your total. Those payment methods ship the same day, as long as it is a week day. If not, the next working UPS day. Personal and business checks are accepted but will delay shipping from 7 to 10 working days for it to clear our bank. Remember clearing our bank not your bank since we have no control over the time frame. Shipping your Firearm ~ Handguns are sent USPS Priority Mail, insured, to your FFL dealer or C&R holder when valid on the firearm. Please note that gun purchases cannot be “picked up” at our location. The "VALID" C&R holder is the person whose name is on the C&R License, and is the "SAME" person who won the auction! NO EXCEPTIONS! We ship Monday through Friday so your gun reaches you in a timely manner. Once payment and FFL are in hand, we ship the next business day. And email you the delivery date and tracking number at that time! Inspection Period ~ All used firearms come with a 3-day inspection privilege. Inspection period begins the day of delivery to your FFL. 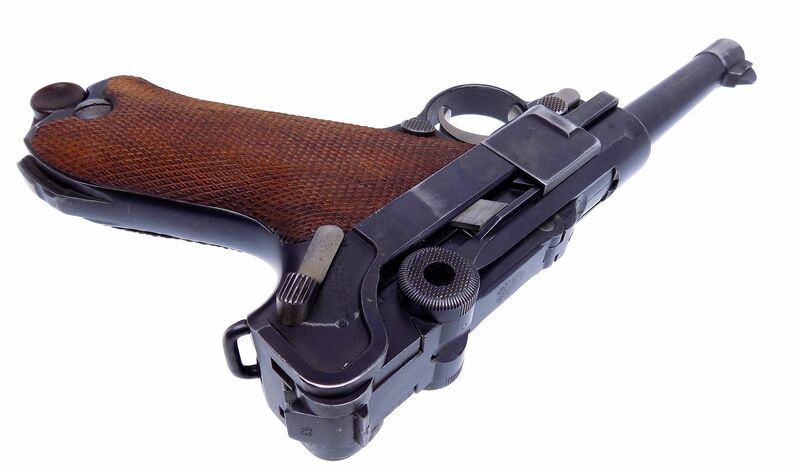 It is your responsibility to inspect the gun in that time frame. In the case of a return, buyer pays all return costs. This does not cover items damaged in shipment; you must save the damaged shipping box and file a claim with the appropriate shipping company. All items must be in the exact condition that they left us in. The inspection period does not include the firing of the firearm. 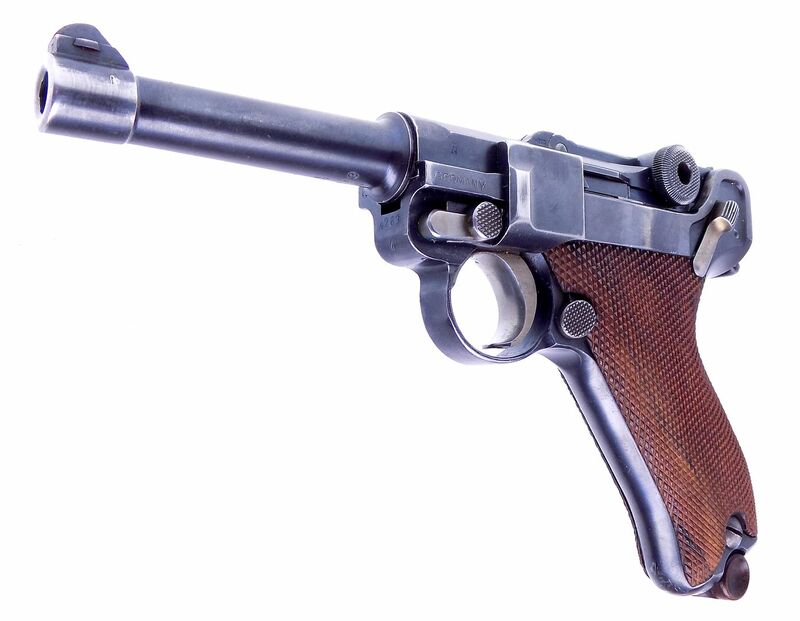 If the Buyer does fire the firearm at any time during the inspection period, the sale is considered final. 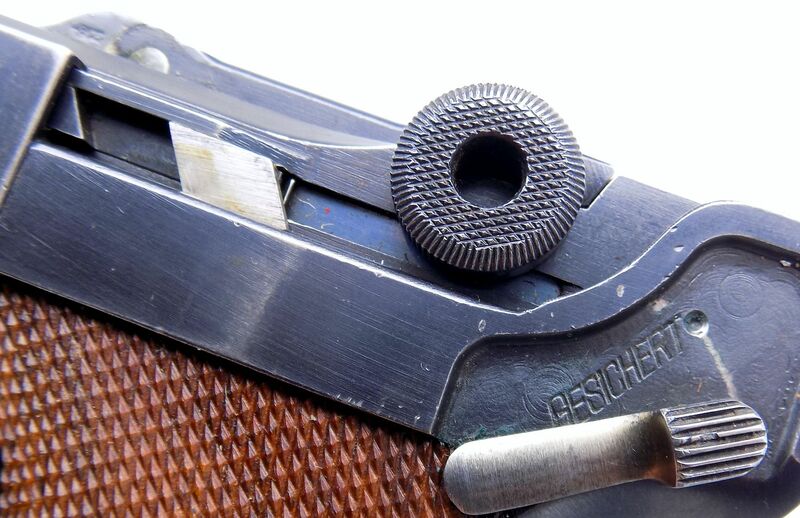 Inspection consists of external examination, working the action by hand to see it operates, checking bore and having the headspace checked by a gunsmith. 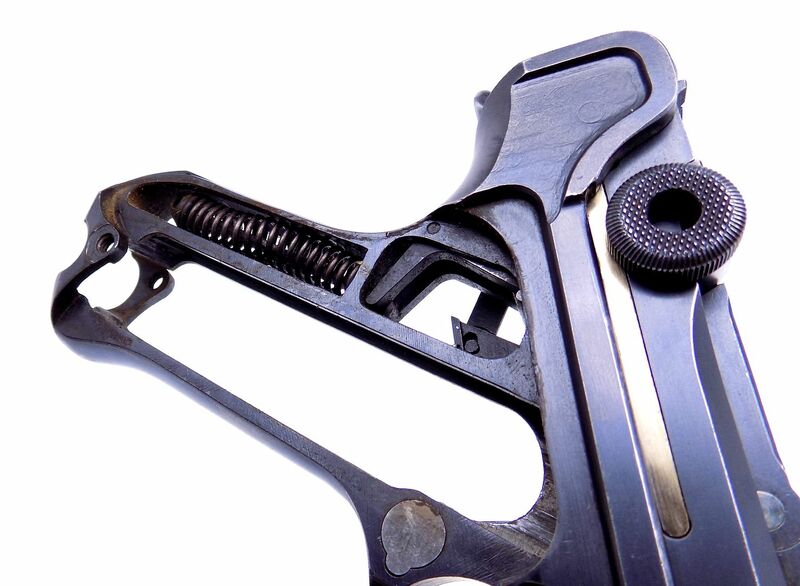 No further disassembly is permitted, includes but not limited to turning any screws or removing any punch pins. Shipping Requirements ~ All firearms are shipped to your FFL or a valid C&R holder if the firearm qualifies for it. A copy of your dealers FFL must be in hand before we ship! The same applies for a C&R holder. 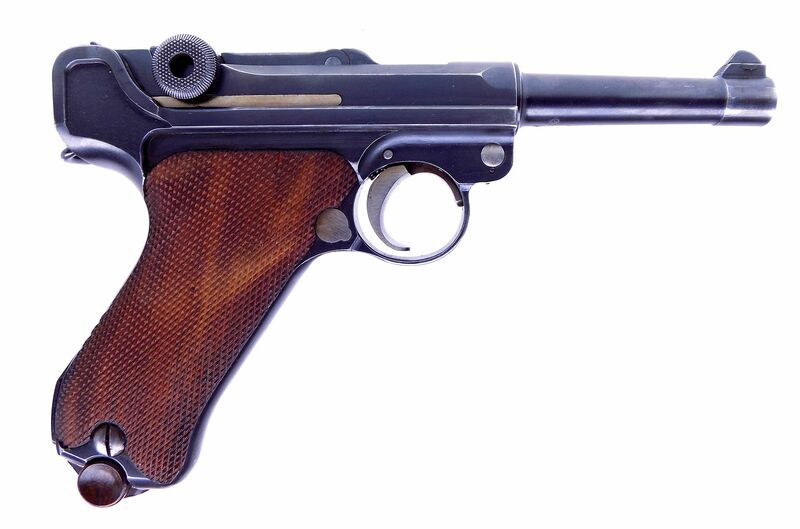 Any firearm that qualifies for "Antique" status will be shipped directly to the winning bidder. A copy of bidder's driver's license for proof of age will be needed. We ship ship "5" days a week, Monday through Friday! Contact and Local Pickup ~ Please note that purchases cannot be “picked up” at our location. If you need to contact us about the auction our email address and phone number are included in the invoice that is sent to the winning bidder. 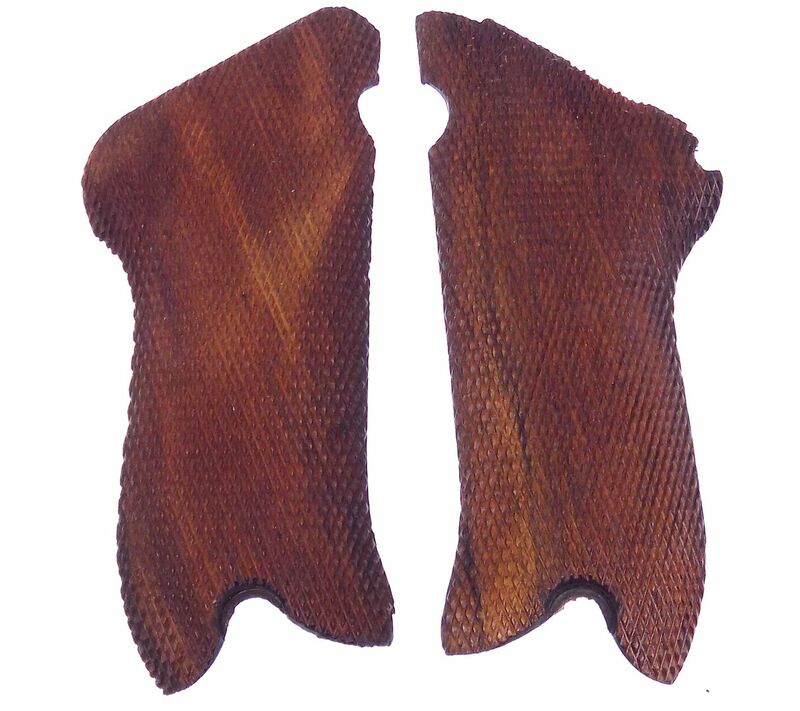 End of Auction~ We send out an email directly at the end of the auction to the winning bidder. This is done through the Gun Broker system and sent to the email that you registered with and is on file. Please make sure that email is current with Gun Broker! There are instructions on how to complete the purchase included in that email. 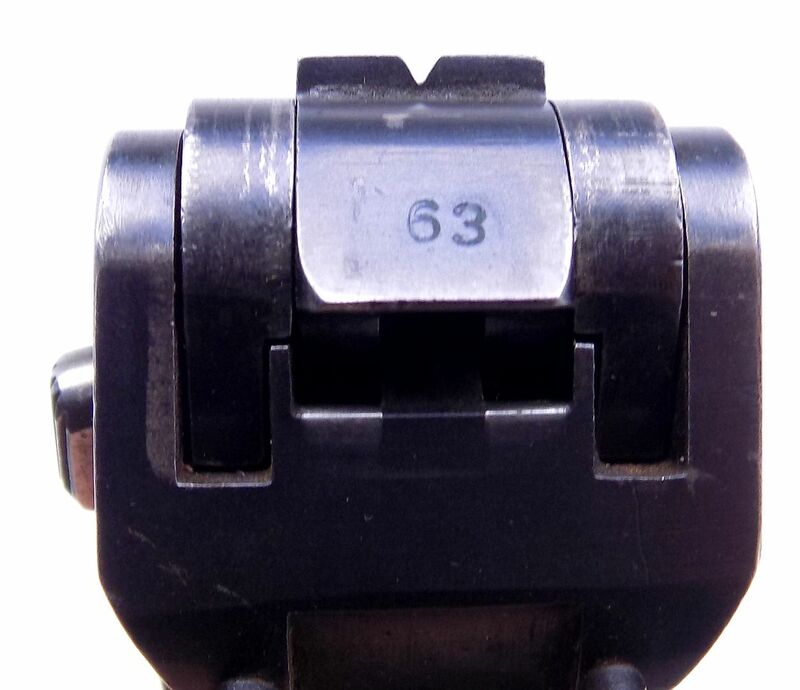 California - 10 rounds maximum for all magazines. Hawaii - 10 round maximum for all handgun magazines. 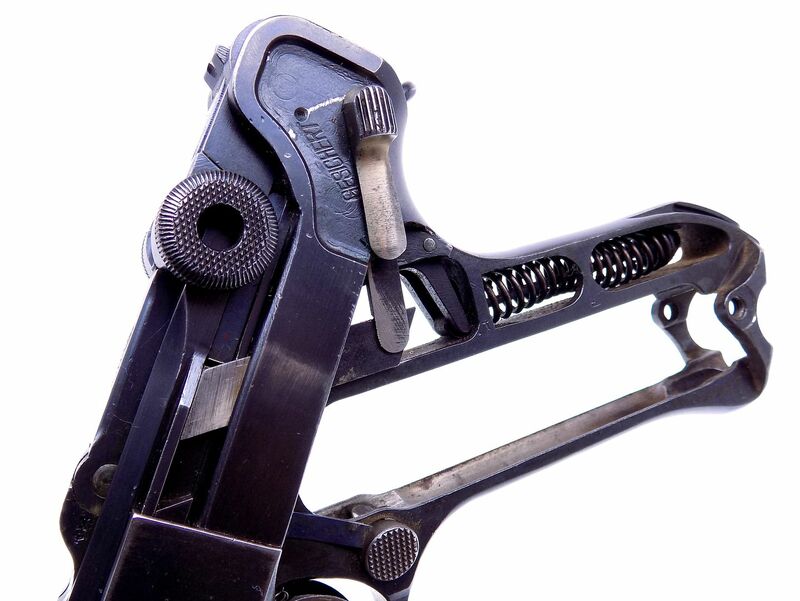 Massachusetts - 10 rounds maximum for all magazines. New York - 10 rounds maximum for all magazines. DISCLAIMER and Return Policy ~ PLEASE READ BEFORE BIDDING!!! 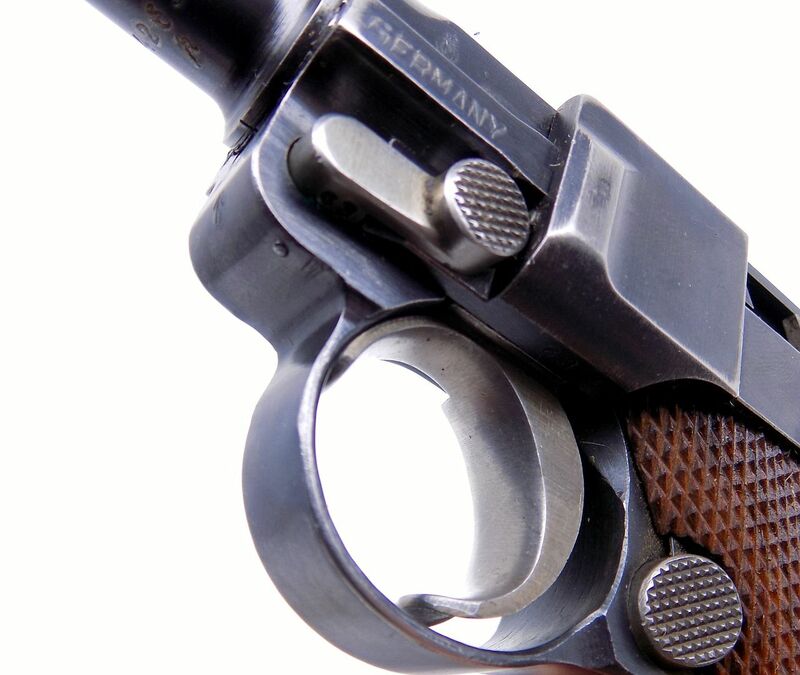 - Winning Bidder Responsibilities are that of determining that a used firearm is safe to shoot. 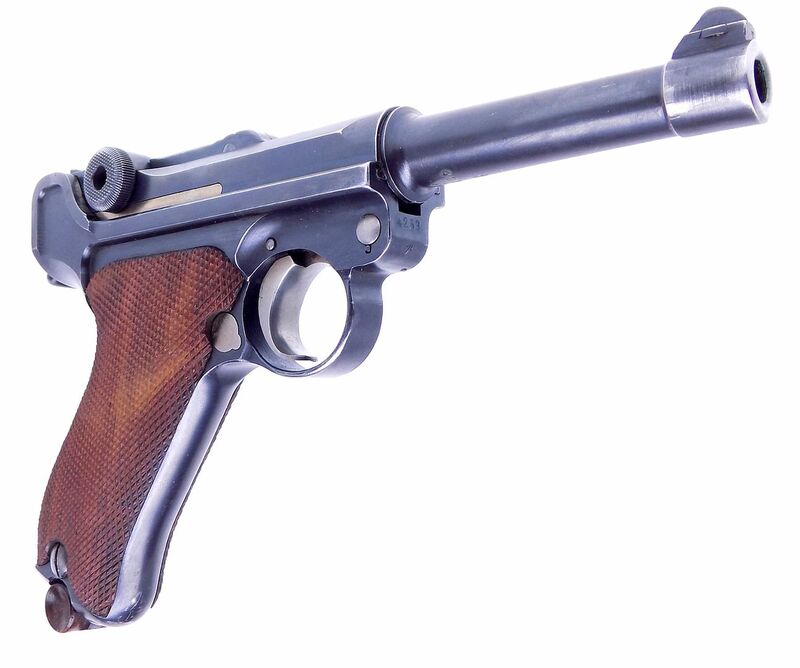 Firearms have been given a visual inspection only for auction purposes, unless noted in the description. Dust 2 Dollars urges that every winning bidder have their used firearm inspected by a qualified gunsmith before firing, whether won here, or purchased anywhere! By placing a bid, you are agreeing to hold Dust 2 Dollars harmless against damages, injury, or death caused by defective firearm. Please email DUST2DOLLARS for more details! Contact Dust 2 Dollars about buying or selling you guns for you! We will put more money in your pocket either way!